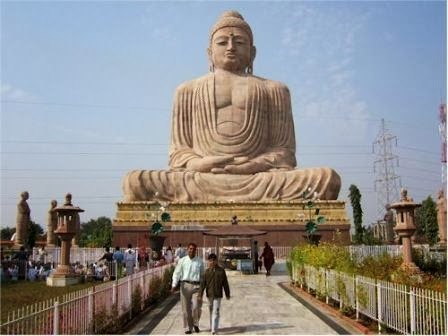 Buddhism is one of the major world religions next to Christianity, Islam and Hinduism. There are around 500 millions Buddhist world-wide, but the majority of them is of course found in Asia, with a divide in Southern (Sri Lanka, Thailand and so on) and Northern Buddhism (China, Japan, Tibet and so on). Different Buddhist schools and traditions are very diverse and there is no single dominant authority or spiritual head of Buddhism as we for example find it in the case of the pope for Catholicism. What all of them share however is strong veneration for the founder of Buddhism, the Buddha. The man, who later came to be known as Buddha Shakyamuni or in short the Buddha, was born in the town of Kapilavasthu belonging to the small kingdom at the border between India and Nepal. The kingdom was governed by several noble families among which the ruler of the country was elected. At the birth of the Buddha, it was his father who reigned the kingdom of the Shakya, and the Buddha was consequently born as Prince Siddhartha Gautama of the Shakya clan. In accordance with the Theravada-tradition, he is said to have lived from 623-543 BCE. Due to differing accounts available in other sources, the exact dating of the Buddha is however highly debated among Western scholars and it is generally accepted that he lived somewhat between 500-350 BCE. 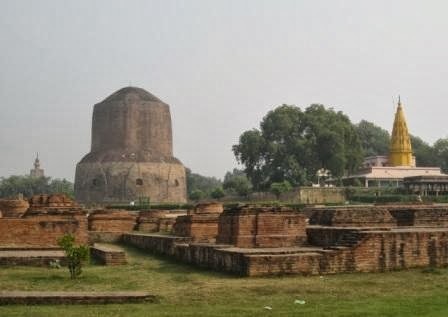 Recent findings in Lumbini revealing the structure of an ancient shrine which dates back to the 6th century BCE could provide new fuel to the discussion. Whatever his exact date, the Buddha lived during a very important time in India that saw the rise of many new religious and philosophical doctrines. Many of them rejected the dominating position of ritualism in the Vedic traditions and the powerful role which Brahmins occupied in them. Wandering priests roamed the country to preach new doctrines of salvation to an audience that wanted to quench their thirst for insight, and the Buddha was one of them. Having been raised as a potential heir to his father’s throne, it is said that Siddhartha had been kept away from the suffering of the world. Traditional accounts record that Siddhartha managed to escape the sorrow-free palace life on a few occasions, and made four encounters that left a deep impression on him. The first three encounters with an old person, a corpse, and a dying person made him aware of the inevitable sufferings of life. The fourth encounter was with a peacefully smiling ascetic who was seeking a path beyond suffering. The encounter with the ascetic left a strong impact on the young prince. He developed the growing wish to seek out a path beyond suffering with which he could help liberate all beings from the endless cycle of rebirths. At the age of twenty-nine, the urge had become so strong that Siddhartha left his father’s palace as well as his wife and son behind. He shaved his head and became a wandering mendicant. 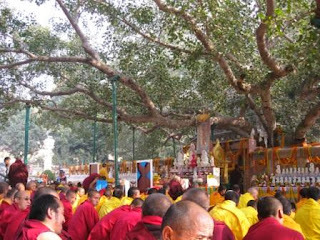 Until today, Buddhists who undergo their first refuge ceremony by which they become Buddhists are symbolically cut a lock of their hair in commemoration of the Buddha’s departure from the worldly life. The Buddha wandered around and learned from different teachers that were popular during his time. It is said that he quickly mastered the doctrines he was offered, but left as soon as he found that they did not constitute a method to achieve final liberation from the endless circle of rebirth and suffering. He finally decided to follow his own path of practicing sever austerities together with five companions. After six years of extreme hardships that he took upon himself in order to free his mind by subduing his body, he was so weak that he almost drowned while taking a bath one morning. Having been offered a rice-porridge by a girl named Sujata that had witnessed what had happened, he regained some strength and understood that this was again not the right path he was on. Prince Siddhartha decided to follow a middle path from now on, a path that would neither idealize severe austerities nor advocate indulgence in sense-pleasures. He left the five companions behind and set out for Bodhgaya. In the evening, he sat down under a bodhi tree (ficus religiosa) with the intention to stay in his meditation until he attained liberation from the cycle of rebirths. It is said that his meditation developed throughout different types of Samadhi, states of deep meditation, until dawn when he finally defeated Mara, the god of desire. The Buddha had reached the final goal of Buddhism, perfect awakening or Buddhahood. In this teaching, the Buddha laid down the middle way between the extremes of indulging in sense-pleasures and ascetic practices, and explained his famous Four Truths of the Noble Ones. He explained that there is suffering, the truth of suffering. He further explained the origin for this suffering, the truth of the origin of suffering, and that this suffering can be brought to an end, the truth of cessation. Most importantly, he also showed a path how to achieve this, the so-called Eightfold Path of the Noble Ones, the truth of the path. By practicing on the basis of the first sermon taught in Sarnath, the five former companions gained spiritual insights, and from this moment on the three jewels of Buddha, Dharma and Sangha are considered to be present in our world. A Buddha, a fully awakened one has occurred, he has taught the Dharma and there is a Sangha or community of practitioners that gained spiritual insights by practicing the Dharma. For the following forty-five years, the Buddha kept traveling and teaching his doctrine in the Ganges valley. While Brahmins stressed the importance of Sanskrit as a sacred language, the Buddha taught his doctrine in the language of the people. The Buddha gained a large following from all castes and gender, comprised of lay people, monks and nuns. He finally passed away around the age of eighty at Kuśinagara. After his death, his remains were divided among his followers and enshrined in so-called stupas or relic housings. He left behind a large legacy of teachings attributed to him which were first orally transmitted. The corpus of scriptures was compiled during several Buddhist councils and was eventually set down in writing. It spread throughout many countries and was translated into numerous languages over the course of time. The influence of the Buddha and his simple message expanded far beyond the spheres of the Buddhist following alone and continues to be attractive for people from all backgrounds until today.